Have you ever wondered where your front lawn sod came from. The following YouTube video gives a demonstration on how sod is harvested into round bails and stacked on pallets for distribution to retail outlets. It takes 11 months to 18 months to start from seed to a finished sod product. Check out this video and take some time to see how technology has really come a long way with respect to harvesting, in this case, sod. Lush, dense grass foliage 2 or more inches long. Moist soil around the roots. A thick matrix of grass roots visible in the soil. Soil no thicker than 1 inch. Roots knit together well to survive handling without tearing. Are the grass varieties in the sod like mine? A “yes” assures that the sod is appropriate for use in your region. Are the varieties in the turf from certified seed or certified sprigs? A “yes” assures the genetic purity in the grass–you get what is promised. If it is a mixture of grasses, what is the ratio of the various components? It is important to know the dominant grass in the mixture so you can care for it properly. How old is the turfgrass sod? 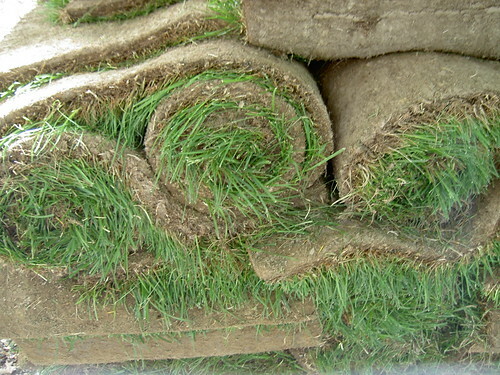 Look for recently harvested sod. While older sod is not necessarily inferior, with some grass varieties it develops a layer of thatch. This may cause drought stress and retard rooting into the soilbed. What type of soil was the sod grass grown on? Try to match the soil type and texture as closely to your own as possible to facilitate rapid rooting in the soilbed. When was the sod harvested? It’s best to install sod within 8 hours of harvest so the grass plants are not stressed by moisture loss and become vulnerable to disease and pest problems.